In towns across America today, people are celebrating the Fourth of July with barbecues, parades, and fireworks. The thousands of people singing patriotic songs, picnicking, and watching fireworks in Rebild National Park are no different. What’s unusual about this Independence Day celebration, though, is that it’s not in America—it’s in Denmark. Called Rebildfesten (The Rebild Festival), this annual event—the biggest Fourth of July celebration outside America—has taken place since 1912 in northern Denmark. Beginning in the 1870s, large numbers of Danish citizens left Denmark to seek better economic and educational opportunities in America. Between the late 19th and early 20th centuries, approximately 300,000 and 500,000 Danish emigrants moved to America. The Danish-American Rebild Society (also called the Rebild National Park Society) is a Danish-American friendship organization that hosts the festival to celebrate these historic ties between Denmark and America. Members of Illinois’s Rebild Society came up with the idea for Rebildfesten. Led by chemist Max Henius, who moved from Denmark to Chicago in 1881, this group of Danish-Americans purchased 140 acres of land in their home country. 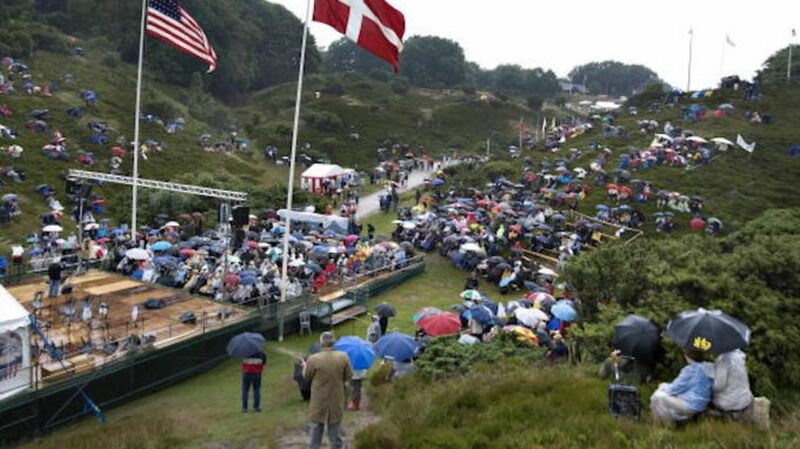 They gave the land to Denmark’s king, with the stipulation that the space serve as a place for the public to celebrate America's Independence Day and honor the U.S.'s generosity to Danish emigrants. And thus, Rebild National Park—Denmark’s first national park—was born. Today the property features a Lincoln log cabin dedicated to Danish emigrant history. The celebration spans the entire weekend, but the Fourth of July itself features a parade (complete with marching band), concert, and midnight fireworks. American and Danish flags ornament the area, and Aalborg, a nearby city, also hosts performances and special museum exhibits during the holiday weekend. Rebildfesten has drawn an impressive lineup of American speakers and guests through the years, including Ronald Reagan, Walt Disney, George Bush, Richard Nixon, Walter Cronkite, Dionne Warwick, Earl Warren, and Keith Carradine (Henius was the actor’s great-grandfather). Besides organizing Rebildfesten, the Danish-American Rebild Society also hosts an annual conference in America, offers study abroad scholarships to Denmark, and works to preserve Danish culture in America. Looking to capture the spirit of Rebildfesten in your backyard this Fourth of July? Be sure to wish your guests a "Glad Fjerde Juli."